The Marple Leaf: Confidence is a preference for the habitual routine for match winning Rovers known as Fist Pump! Confidence is a preference for the habitual routine for match winning Rovers known as Fist Pump! We made a late decision to head for Nottingham Forest today to watch our merry men. A week ago I wouldn’t have backed us to get anything from another team lolling about in mid-table, like Stoke City, with a newish manager and an eye on next season. Something clicked in midweek against Derby County though; as soon as the ball flicked over Joe Rothwell’s heel and into his accelerating path, his control connected with his decision making faculties and he clipped the ball deftly into the corner. On such margins are games won, as are tap ins and lucky bounces. That being Rothwell’s debut goal in a season of fits and starts was significant and it made him literally fit to start this afternoon and, I say this confidently in hindsight, certain to score. His goal came in a spell of intense pressure when he found himself within the range and lashed in the sweetest of finishes. He wouldn’t have had the confidence to even try that had he not lost his goal scoring cherry on Tuesday. We know that Player of the Season shoe-in Danny Graham scores when he wants, and he certainly wanted it again today. But after some delightful twists and the deft drop of the shoulder, everyone in the ground expected Bradley Dack to stretch the net. At that moment he was everything I ever wanted him to be, but for minutes afterwards I was ready to announce on Instagram that Bradley and I were no longer in a relationship. I hope that miss doesn’t knock his confidence in the way his other recent setbacks have. It shouldn’t, because Dack was immense in that second half. His trickery, his intelligent passing out to Adam Armstrong, and his offering of an option to Corry Evans and Lewis Travis, were everything we missed last week. Rovers conceded 19 fouls today. 19. Only a few of them were what you’d call industrial challenges, the kind of roughing up we frankly don’t do enough of. No, they were what our Louis calls “Conway fouls”: forced collisions by players placing themselves in harm’s way. When we do it, Charlie Mulgrew often obliges with a free kick. Forest had one shot on target out of 22, which was our other fortune today. So, the baby elephant in the room remains Ben Brereton. I watched him on the bench in the second half and he was like a coiled spring. When he finally bounced onto the pitch he was more like Bambi on ice, unable to challenge, trap, or control, let alone score a goal against his old team and lessen the burden of that price tag. He had the nuisance presence of a goalie coming up for a corner in the 98th minute; opponents don’t really know what to do with him, neither do his team mates, more to the point. It must be unbearable to be Ben, but I can see the future opening up for him once he’s scored, the trouble is there are no easy games in the Championship, with the possible exception of relegated Bolton at home on Easter Monday. Too easy? I thought that Dack miss, and a fluffed one-on-one by Rothwell, would cost us. It didn’t. And I’m reluctant to be overly critical of our players. They take it to heart and change behaviour as a result. 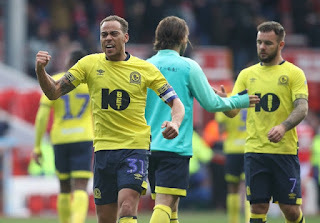 Since some wag on Twitter called Elliott Bennett “a fist pumping Liam Feeney”, the trademark celebration has vanished, though so too have the wins, to be fair. He put a shift in today, even some rough stuff when needed. It was good to have that back at the end. Very good indeed.